Hurricane OLGA, with winds to 90 knots, threatened us for five days during the latter portion of this cruise but stayed to our northeast and did not present us with any serious conditions, but she did challenge our heavy weather preparations. More on this later. We've sailed HALIMEDA over 10,000 miles, mostly blue water, during the past year and during the Summer of 2001 we put her into a well deserved six-week yard period for completion of an extensive list of work. 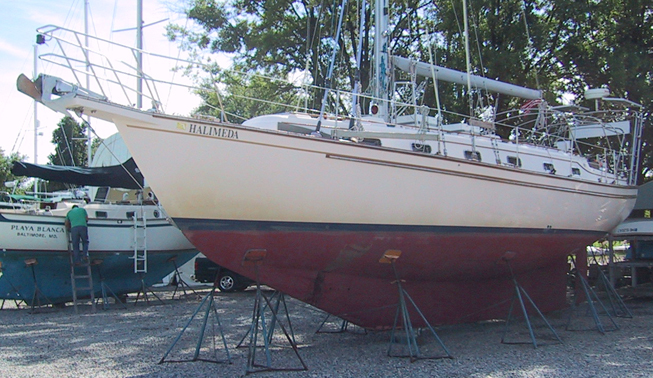 In addition to normal maintenance to her bottom, topsides, teak, sails, canvas, machinery and rigging, we also made sail handling and other upgrades. Added a Tides Marine track slide system to the mainsail to make it easier to raise, lower and reef this large sail. Removed the self-tending boom from the staysail and rigged it with two sheets and two winches as used for a genoa; this plus a Barber Haul allowed much better control of this sail when offshore in heavy weather. Purchased a 100% genoa for use offshore where the big genoa is normally reefed most of the time, and rigged a Barber Haul for this sail also to compensate for the standard sheet fairlead track which is too short for the smaller sail. Installed a new Furuno Weather Fax receiver and a dedicated long wire antenna between the backstays. And, we stocked her with the many spare parts needed for extended cruising. At completion, we felt that HALIMEDA was ready for another big year of sailing as we had planned for her... she certainly seemed anxious to get out of the yard and to go sailing again! 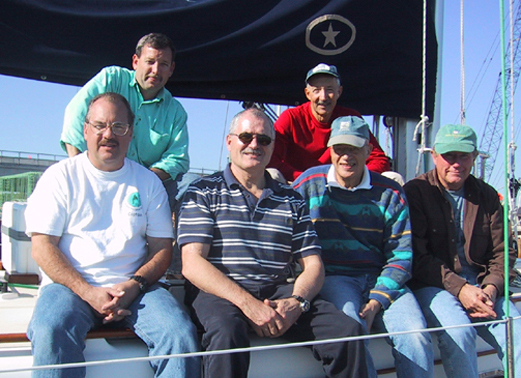 On November 12, 2001, we sailed HALIMEDA out of Rock Hall, MD, our home port and headed south down Chesapeake Bay toward Norfolk and ultimately the Caribbean. 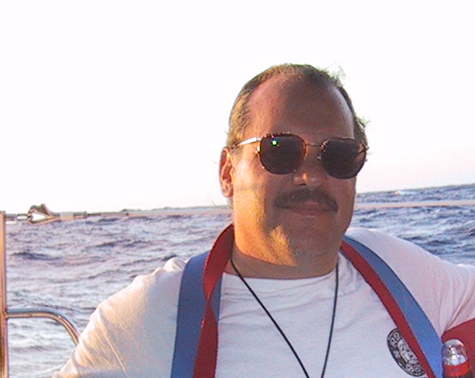 With me were Billy Psimas, who made the entire trip to the Caribbean; Captain Andy Prescott who will skipper HALIMEDA in the Caribbean during March 2002; Brooks Leight who is the Charter Manager at Gratitude Yachting Center; and Tom Tontarski, spouse of Denise from our school office. We had a pleasant two day sail down Chesapeake Bay to Norfolk with a one night anchoring stop at Solomons Island on the Patuxent River. The delivery crew departed next day and Billy and I set to work preparing for the arrival of our remaining offshore crew. 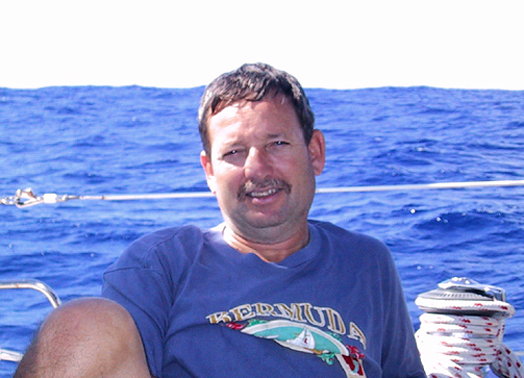 On November 15th, our remaining crew arrived including First Mate Mike McGovern who has sailed with us on many offshore training cruises over the past several years, owns an Alberg 30, is an ex-submariner, cool under stress and knows how to sling a tasty stew under rough conditions at sea. Marx Bowens is a physician from Massachusetts who owns an Island Packet 380 and was extremely helpful in reviewing our medical stores. A. Jay Dolby from Delaware owns a Pearson 40 and is planning to sail off into the sunset in the next couple of years and planned this cruise to help him in those preparations. 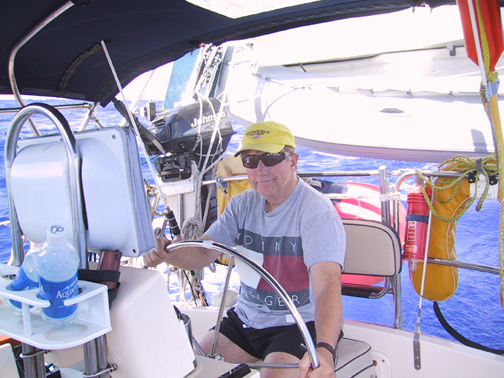 Louis Trepanier from Quebec is having a Hallberg Rassy 36 built in Europe which he intends to sail Trans Atlantic to Canada upon completion. 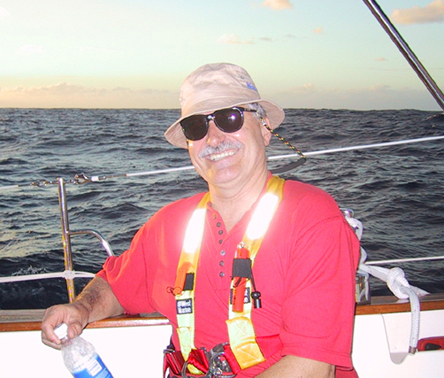 Billy Psimas from Virginia owns a Catalina 36, has progressed through our entire sailing program from basic, and also intends to sail off into the sunset in coming years. So, we had a fairly experience crew for this cruise with aspirations of doing a lot more sailing, and a very pleasant group of shipmates they were. We started our pre-departure training on November 16th by deploying all sails, one at a time at the dock, and thoroughly reviewing sail handling procedures including the Mainsail, Genoa, Staysail, Trisail, Cruising Spinnaker and the Whisker Pole used to wing out the genoa for downwind sailing. Later that day we rigged and deployed the Sea Anchor at dockside; this is an ultimate defense tool used in extreme storm conditions, like a hurricane, and hopefully will never be needed. Next, we did a practice walk through of abandon ship drills including raft deployment, PFDs, abandon ship bags and radio procedures. After that, we demonstrated deployment of the man-overboard rescue gear. That was a pretty full day of work, and we knocked off in late afternoon for some relaxation and dinner ashore. On November 17th, I assigned crewmembers to their inspection and preparatory assignments as follows: Billy & Louis as Boatswains, Jay as Engineer and Marx as Emergency Coordinator. With assistance and oversight from Mike and myself, each crewmember had to closely inspect the yacht, equipment and procedures to ensure that all was in order and inventoried and that we were ready for the coming offshore passage. I looked after the navigation and route planning and associated equipment inspections as well as weather reports and analysis. 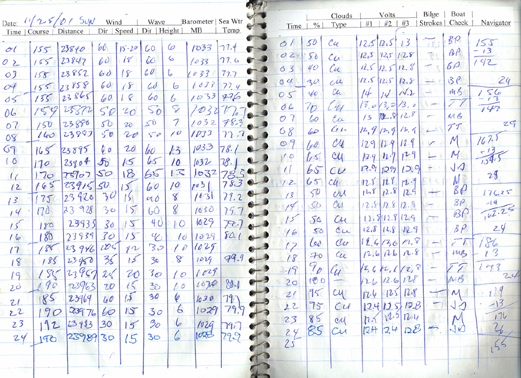 I briefed the entire crew on these vital areas and outlined how we would keep our ship's navigational plot: In the logbook, we record the course steered and distance traveled during each hour and keep a dead reckoning plot on DMA Position Plotting Sheets; each Watch Captain will be responsible to update this plot at the end of his four hour watch. 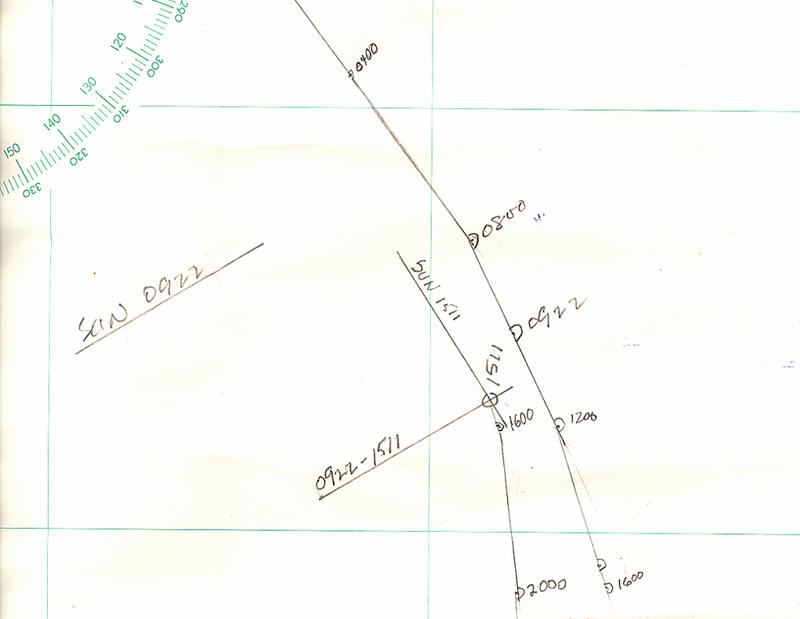 This way, the DR plot will always be up to date and ready for celestial lines of position when available. On this day, we also finalized our menue planning and food shopping. Mike did a great job in advance meal planning at home prior to coming to Norfolk, and he cooked and froze a number of supper meals to simplify that effort underway; we later came to really appreciate his thorough efforts in this vital area. On Sunday, November 18, the weather forecasts promised a good weather window for the next day or two, and we finalized plans for departure as scheduled on that day. Our planned route included two legs: The first was from the Chesapeake Bay to a point "x" located at 27 degrees North latitude and 64.5 degrees West longitude. This gave us a rhumbline of 135.5 degrees True and 835 nautical miles (NM) to point "x" located 320 NM south of Bermuda and 500 NM straight north of our destination in the Virgin Islands. Point "x" was chosen to ensure that we get far enough east before we get too far south into the Trade Wind belt where the winds usually blow strong from the east and can make it all but impossible to get east in these ocean conditions. 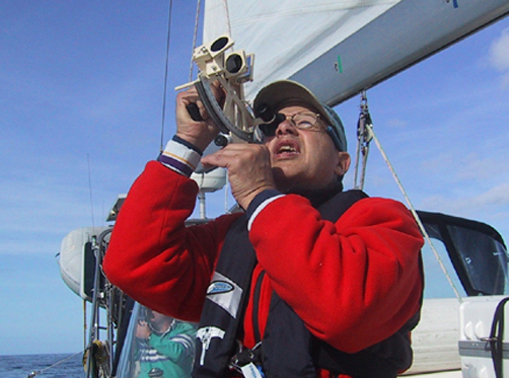 The second leg is then straight south from point "x" with the wind on port beam, or at worst, port bow. This is the theory and it usually works this way, but as we shall see, OLGA prevented this fine theory from working as advertised. The second route planning issue to consider is the Gulf Stream flowing northeast at 2 to 3 knots; we'll enter this flow about 100 miles from our starting point as it passes Cape Hatteras and sets a course for England. The Stream is about 60 miles wide at this point, and the highest current speeds are encountered in the western one-third of this width. Generally, I plan to enter the Stream about 30 miles south of our rhumbline to allow its current to carry us back toward the rhumbline. The Stream is notorious for large, steep waves, but I think this is an over rated concern if one enters it with a good eye on the weather. The main issue is not to be in the Stream in this area with strong northeast winds which will oppose the current and produce large waves. This means don't be there with a low pressure storm system located to your south as this will produce the unwanted NE winds. Low pressure systems located north of you will produce SW winds which blow up the Stream in the direction of current flow. Initially, on departure winds were very light from the east and we motor sailed about 20 degrees south of our rhumbline; this was ok since we wanted to be south on entering the Stream. Our weather forecast included no low pressure systems in the first two days and indicated a cold front approaching. We entered the Stream at mid-day on Monday as the winds clocked to SE then to SW by mid-day on Tuesday and to N by late Tuesday. The next 24 hours were squally and rainy typical of an approaching cold front, and by Wednesday afternoon the skies cleared, winds cooled and freshened and settled in to a steady NE flow at 15 to 20 knots. By this time we were long past the Gulf Stream and the wind direction was not a problem; in fact, it was perfect for a screaming reach along our rhumbline. For the next five days we reeled off 160 mile days and by Sunday, 11/25 we reached latitude 25.3 degrees North and longitude 64.7 degrees West where we made our turn south toward St Thomas. A few days earlier, on Friday, 11/23 we noted the troubling development of a low pressure system to our east centered at 30N/50W and packing gale-force winds. 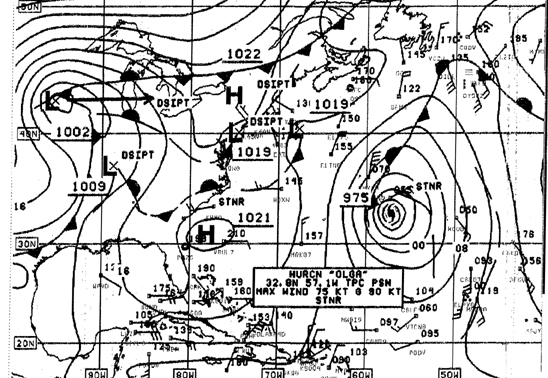 By 11/24 it intensified to storm levels with winds above 48 knots, and by 11/26 it reached hurricane strength with winds to 90 knots and was named OLGA by the meteorologists. During this time it remained fairly stationary wandering westward to 30N/55W, and we had not yet received any of its severe winds. Our concerns were threefold: One, that it might move toward us. Two, it was now producing large storm swells in excess of 15 feet that were overtaking us from astern. And three, it blocked the easterly Trade Winds and gave us northerly winds which forced us to run down wind toward our destination rather than the preferred screaming reach. If OLGA had decided to move SW, we could have serious problems. To prepare for this potential danger, on 11/26 we removed the genoa from the headstay, furled the mainsail, put up the storm trisail and continued sailing south with trisail and staysail. But OLGA remained fairly stationary during this entire time and never directly threatened us although we were within 400 miles of its 90 knot winds. We were making poor speeds with this sail combination, and on 11/27 put up the genoa and mainsail to increase boat speed and put some distance between us and OLGA. The large swells from OLGA continued to follow us and we kept the companionway hatchboards in place to guard against boarding seas. The weather forecasts continued to report large breaking waves in the Virgin Islands where these storm swells bunched up and toppled as water depths decreased. Weather watchers that we spoke with by radio in the Caribbean told us of rough, breaking conditions in the passes between islands. On arrival in St Thomas, we had to sail between the islands and enter port on the south side of the island. With the large breaking waves in mind, we elected to enter through Virgin Island Passage which is five miles wide and should be only minimally effected by the storm swells. At 2:00 am on Thursday, 11/29 we arrived on soundings when the water depth reduced to less than 600 feet and began to register on our fathometer. 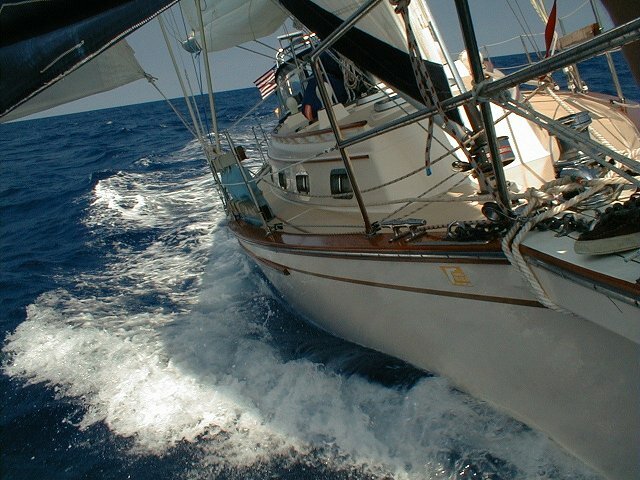 At this point we hove to under reefed mainsail and awaited daylight to enter the islands. At 4:00 am we resumed sailing toward the west end of St Thomas as rain squalls descended from the north periodically blocking our view with torrential downpours. 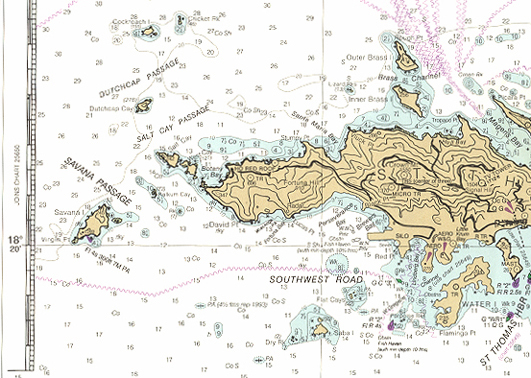 We avoided the narrow passes and opted to sail west around Savana Island which lays off the western tip of St Thomas. 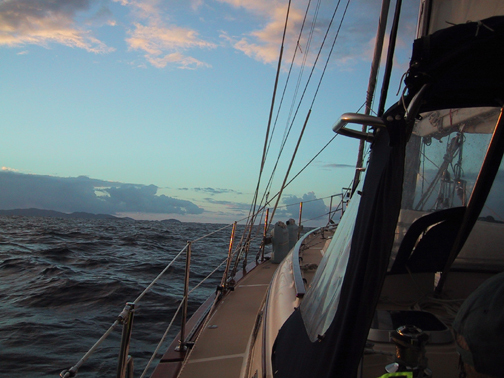 On rounding Savana Is, we turned east and came to close hauled in 25 knot winds. With staysail and reefed mainsail, we had a bracing sail with rain and spray flying and canvas snapping smartly and sailed into Southwest Road toward Crown Bay. At 0830 we contacted Crown Bay Marina by radio and received entering and docking instructions. By 0900 we were snugged down neat and tidy in our winter slip.